Lock in a great price for Forward Hotel Taipei - SongJiang – rated 8.5 by recent guests! Quiet area near orange line. In the middle of Taipei. Great staff. Comfy bed snacks and water in the room. English speaking. They offer a device to rent for tethering to your US device so you won't be without internet. Great spot for first time travelers to Taipei. Nice bathroom. The room was really nice, well laid out and I loved the simple hanger for clothes rather than a closet. Bathroom was perfect. I also had a balcony which was really cool. Lots of good restaurants right around the corner and 1 block from the metro. your staffs are excellent, housekeepers are very professional, front desk are patient and polite. location is excellent, convenient! The breakfast is good, but the bread is not very fresh, however, overall is perfect. The bathroom was great! plenty of space and the water pressure was perfect. Sometimes, at hotels, you can't tell how the water pressure is but this was great! The staff was FANTASTIC. I was sick my first day and they helped me find a pharmacy to get some medication to help with it. Super friendly and helpful! It is neat n clean. The staffs are friendly n helpful. The location is convenient. Comfortable bed and very nice staff. Location wise is excellent as well. My room has balcony. This is absolutely a lovely surprise. perfect location from Songjing nanjiang station (orange line) so you can get anywhere very easily and the breakfast was also quite good ! Great & convient location, near MRT station , lots of dining restaurants . Room is clean and quiet. We have a nice sleep after long traveling. Forward Hotel Taipei - SongJiang This rating is a reflection of how the property compares to the industry standard when it comes to price, facilities and services available. It's based on a self-evaluation by the property. Use this rating to help choose your stay! 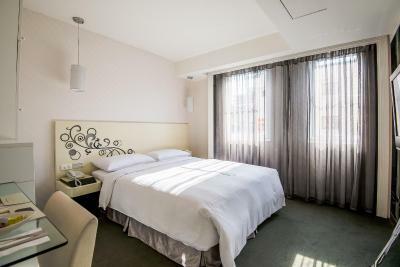 Just a 3-minute walk from MRT Songjiang Nanjing Station, Forward Hotel Taipei - SongJiang offers bright and modern rooms in Taipei. Free WiFi is available in all areas and free parking is possible on site. Guests can exercise at the fitness center or relax at the massage corner. 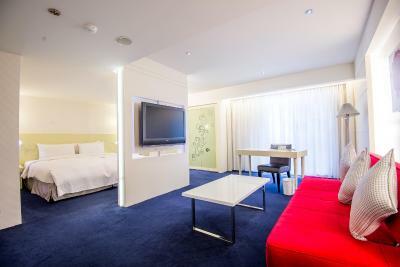 Forward Hotel Taipei - SongJiang is a 7-minute drive from Xingtian Temple and Ningxia Night Market, while Taipei Main Station and Taipei Songshan Airport are a 10-minute drive away. It takes 40 minutes to drive to Taiwan Taoyuan International Airport from the property. Featuring air conditioning, all room come with a flat-screen TV, refrigerator and deposit safety box. The private bathroom has shower facilities, free toiletries and hairdryer. For guests' comfort, a bathtub is provided in some units. Staff at the 24-hour front desk can assist guests with currency exchange, ticketing service and free luggage storage. Extras offer dry cleaning, ironing and laundry services. Shuttle service and car hire are also possible upon request. The hotel restaurant serves daily buffet breakfast with Chinese and western choices. When would you like to stay at Forward Hotel Taipei - SongJiang? Featuring air conditioning, this double room is fitted with a flat-screen TV, DVD player, mini-bar, electric kettle and refrigerator. The private bathroom has shower facilities, free toiletries and hairdryer. Some unit comes with a bathtub. Guests may inform the property about their preference in advance. Please note that the maximum number of staying guests is 2. There is no capacity for an extra bed. Featuring air conditioning, a balcony and a seating area with sofa, this suite is fitted with a flat-screen TV, DVD player, mini-bar, electric kettle and refrigerator. The private bathroom has shower facilities, bathtub, free toiletries and hairdryer. Featuring air conditioning, this twin room is fitted with a flat-screen TV, DVD player, mini-bar, electric kettle and refrigerator. The private bathroom has shower facilities, free toiletries and hairdryer. Featuring air conditioning, this twin room is fitted with a flat-screen TV, DVD player, mini-bar, electric kettle and refrigerator. The private bathroom has shower facilities, bathtub, free toiletries and hairdryer. Featuring air conditioning and balcony, this suite is fitted with a flat-screen TV, DVD player, mini-bar, electric kettle and refrigerator. The private bathroom has shower facilities, bathtub, free toiletries and hairdryer. Featuring air conditioning, this quadruple room is fitted with a double bed, 2 extra beds, flat-screen TV and refrigerator. The private bathroom has shower facilities, free toiletries and hairdryer. Featuring air conditioning, this triple room is fitted with a double bed, a single bed and a flat-screen TV. The private bathroom has shower facilities, free toiletries and hairdryer. Please kindly note, the room type will be assigned by the property upon check-in. For more information, please contact the property directly. Featuring air conditioning and balcony, this double room is fitted with a flat-screen TV and a refrigerator. The private bathroom has shower facilities, free toiletries and hairdryer. We are a design hotel which offers free coffee, sparkling water in front desk. The rooms are comfortable and clean. Our hotel is located in central of Taipei which is very convenient. House Rules Forward Hotel Taipei - SongJiang takes special requests – add in the next step! Forward Hotel Taipei - SongJiang accepts these cards and reserves the right to temporarily hold an amount prior to arrival. Not an exciting part of town. No food around at night. Not close to many attractions. The lobby was a bit untidy. Lots of stuff laying around both in front of and behind the front desk. Wasn’t a really good first impression. The one MAJOR issue I had was with the bed, The first night I tossed and turned a lot because the bed was really stiff. I should have remembered that because, hey, it's Asia! I didn't sleep well that first night so I asked for a couple more pillows to help and it made a major difference. The LAST thing is that I like my hotel rooms FREEZING! lol The thermostat wouldn't let me go lower than 20C. I would have had it on 16-17 if it had let me. Convenient locations and good services, cozy room, I can’t find any reasons to not coming again. Early check-in has an additional fee but overall, everything else was great! Facilities and staffs were great! You can do your own laundry for free, wifi connection is good, and the massage chair was a good plus too! Noise from the air-conditioner too loud, that you have to turn off the a/c before you go to bed, improve the a/c unit is highly recommended. Overall good, staffs friendly and helpful, location good, MRT is round the corner. Breakfast is acceptable.